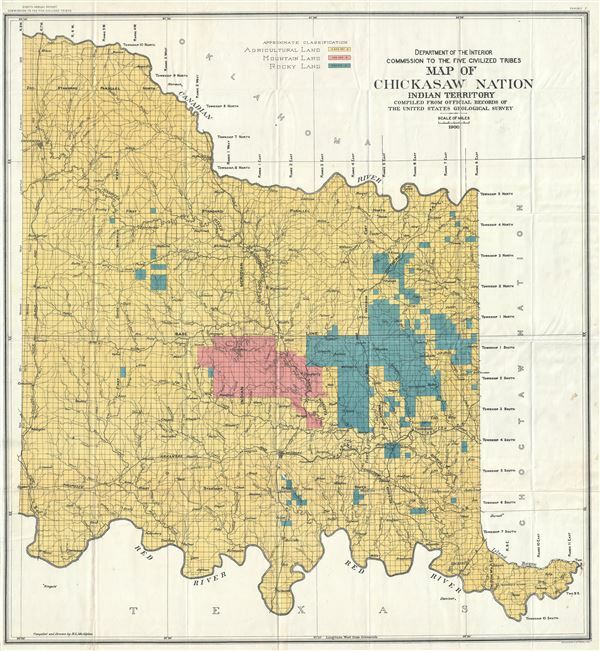 Department of Interior Commission to the Five Civilized Tribes Map of Chickasaw Nation Indian Territory Compiled from Official Records of The United States Geological Survey. This is a scarce and beautiful 1900 R. L. McAlpine map of the Chickasaw Nation issued by the Department of Interior Commission of the Five Civilized Tribes and compiled from the official records of the United States Geological Survey. Part of modern day Oklahoma, the map is centered on Old Fort Arbuckle and covers the Chickasaw Nation as it was located between the Canadian River and the Red River. It notes several rivers, towns, and topography throughout. The map is covered in grids noting the survey conducted by the U. S. G. S. and is color coded to show agricultural land in yellow, mountain land in pink and rocky land in green. During the Indian removal of the 1830s, known as the 'Trail of Tears,' the Chickasaw Indians were forcibly relocated from their ancestral lands in Tennessee, Alabama and Mississippi westward to the federally recognized native American nation, the Chickasaw Nation, located in the Indian Territory (modern day Oklahoma). The Chickasaw Nation was a member of the Five Civilized Tribes along with Cherokee, Seminole, Choctaw and Muskogee nations. The Commission to the Five Civilized Tribes, or the Dawes Commission, was created in 1893 to negotiate with the Five Civilized Tribes to divide their lands amongst individual members of the tribes. This map was most likely used for that purpose. Eventually Oklahoma would be admitted to the Union in 1907 and the 'Five Civilized Tribes' would lose most of their tribal lands. This map was compiled and drawn by R. L. McAlpine and engraved by Julius Bien and Co. Issued in the Eight Annual Report of the Commission to the Five Civilized Tribes as Exhibit 7. Eight Annual Report of the Commission to the Five Civilized Tribes, 1900.